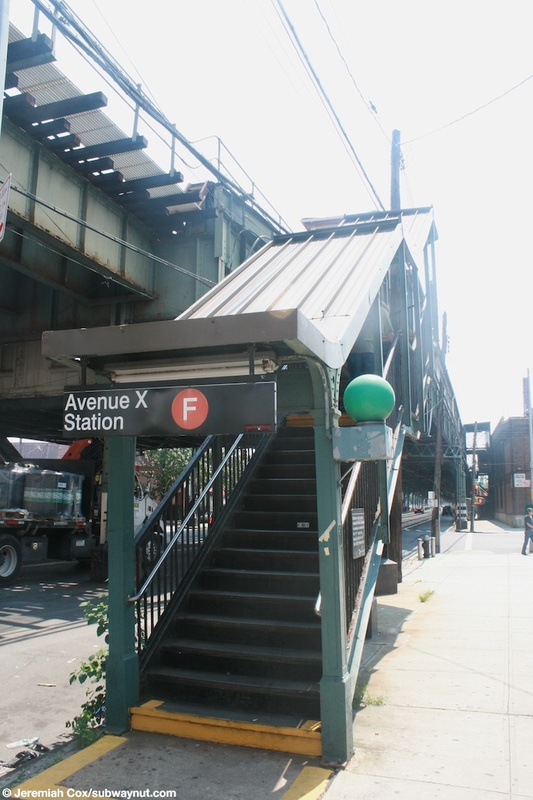 Avenue X is a local station on the Culver Elevated. The station has two side platforms for the three-track line. 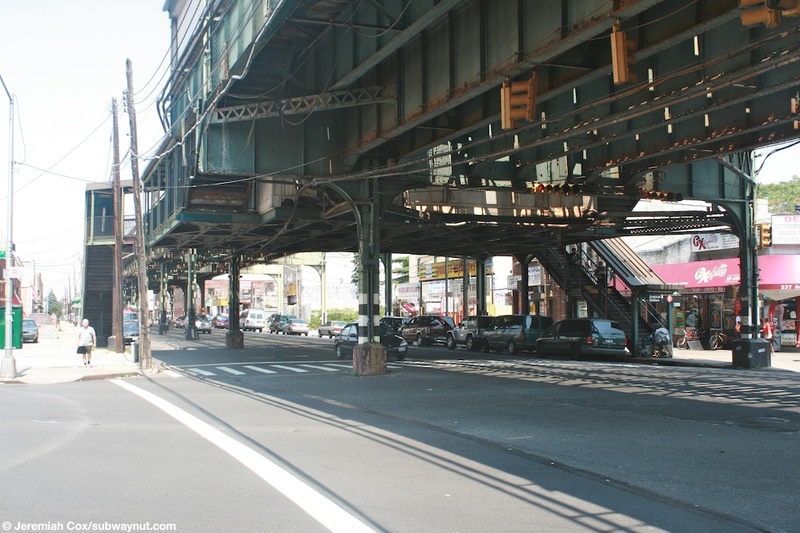 The station rose in prominence on the subway system when it was the temporary terminal of the F line, from September 2002 to May 2004, when it was kicked out of the Coney Island-Stillwell Avenue Terminal so that terminal could be completely rebuilt. 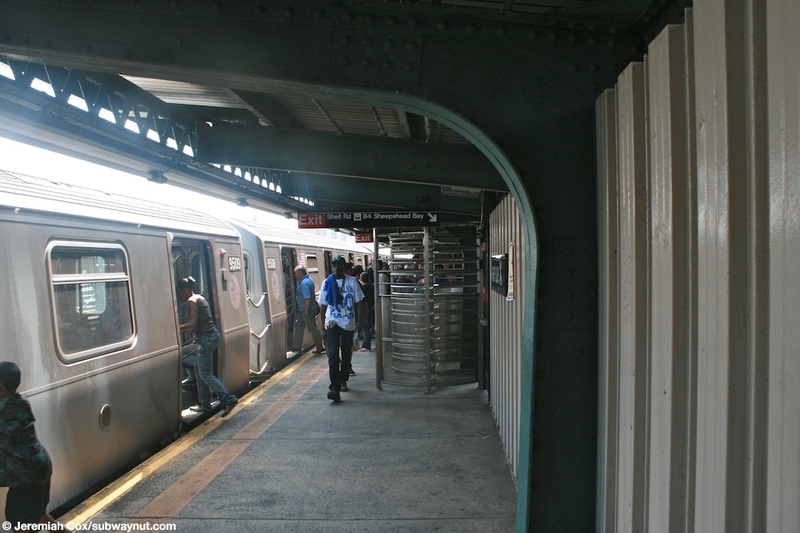 Trains terminating at Avenue X, discharged their passengers on the Coney Island-bound platform before continuing beyond the station to relay and reenter service on the Manhattan-bound platform. 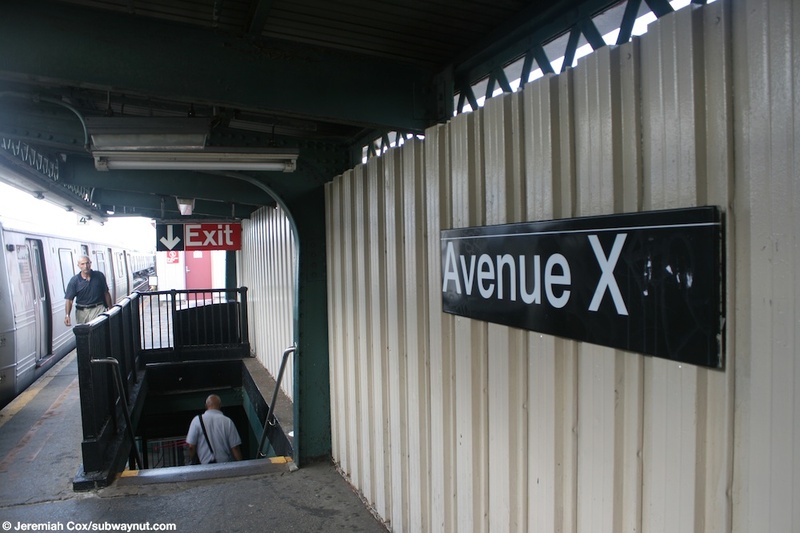 Since Avenue X is a simple local station, train crews were changed in Kings Highway instead of Avenue X. 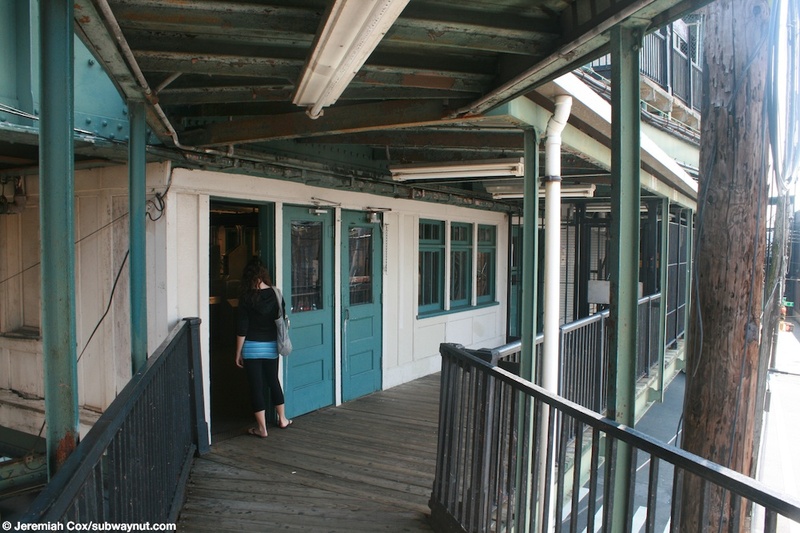 A special 'F Shuttle Bus' replaced train service to Coney Island with intermediate stops near the closed Neptune Avenue and West 8 Street-NY Aquarium Stations. 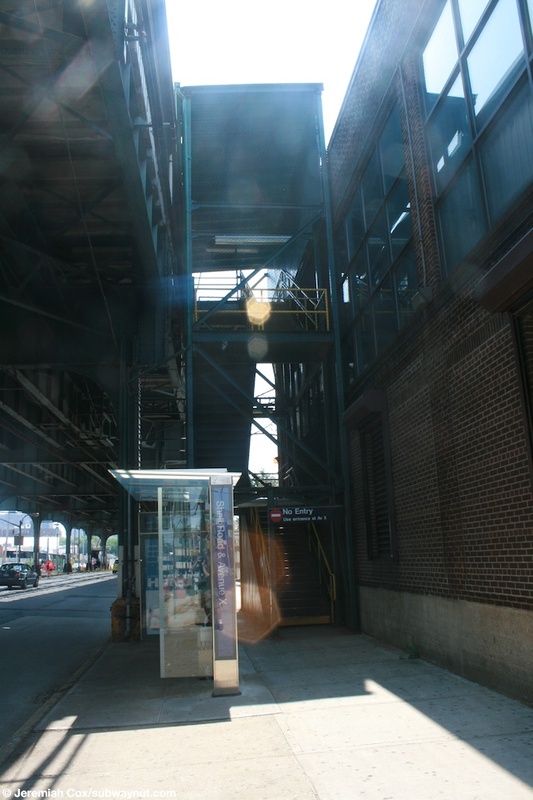 The station has one feature that has been left intact that was built specifically for the shuttle busing. 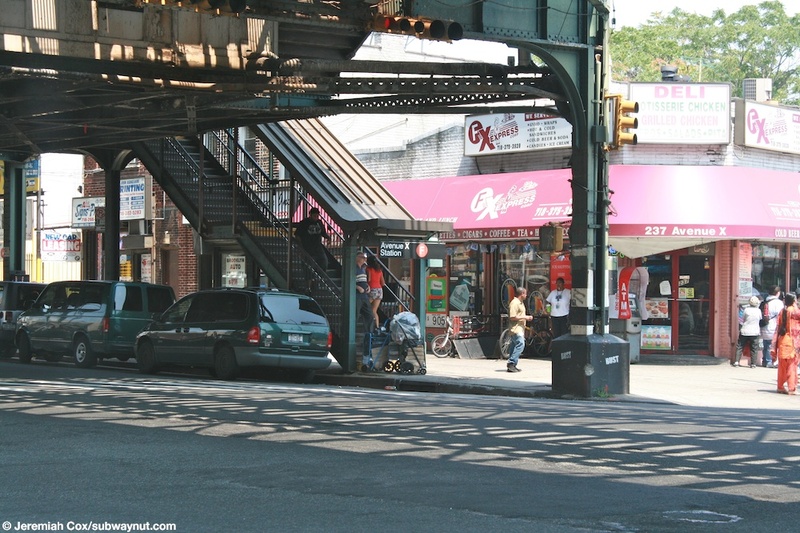 There is a staircase tower-type structure, whose design makes it known that it was added recently, that leads from two High Exit Turnstiles that are directly on the Coney Island-bound platform down to street level, along Shell Road (what McDonald Avenue south of its intersection with Avenue X) just south of the intersection with Avenue X. 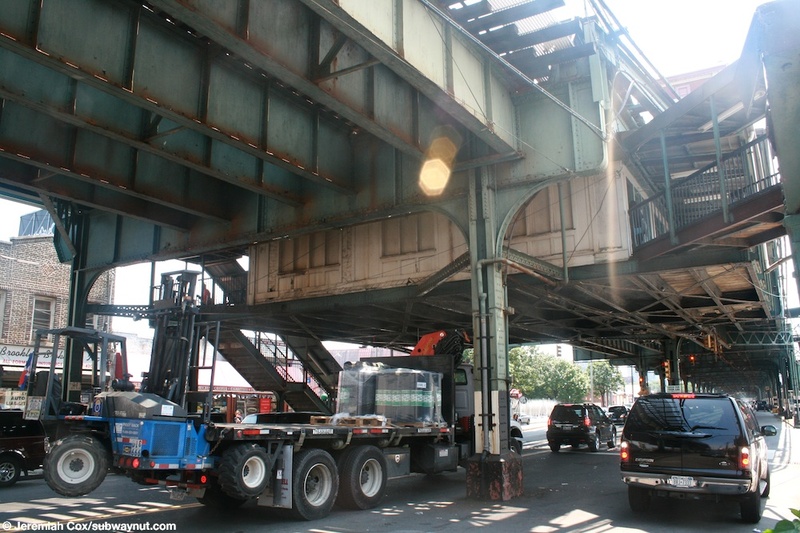 There is still a bus stop here, now just served by the B4 to Sheepshead Bay. The station's main exit is at the extreme northern end of the platforms where a staircase leads down from each side platform to the standard station house nestled beneath the tracks, two staircases lead down from the station house to eitherside of McDonald Avenue, at the northern corners of Avenue X, where the street ends and is renamed Avenue X. 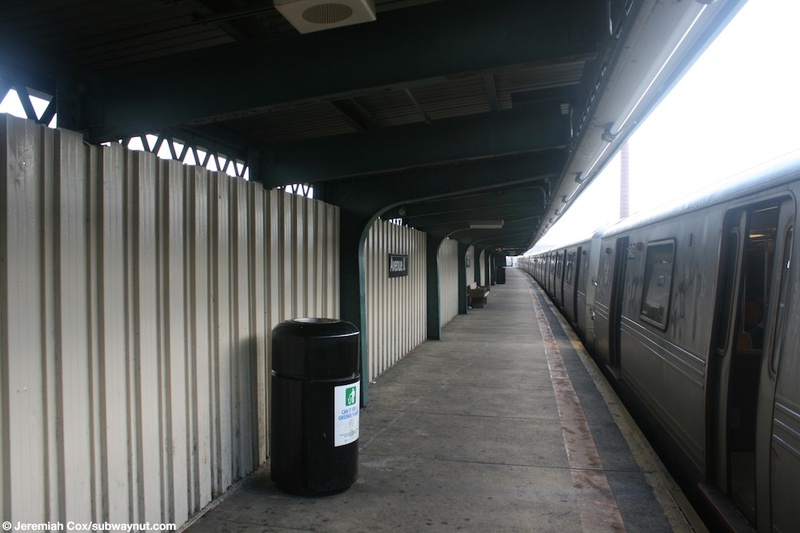 (ave_xf1) Looking down the Coney Island-bound platform at Avenue X, the platform is much more busy than usual because it is being used as the transfer point from Main Line F trains (that are terminating here), to a special shuttle train that is running between here and Coney Island. 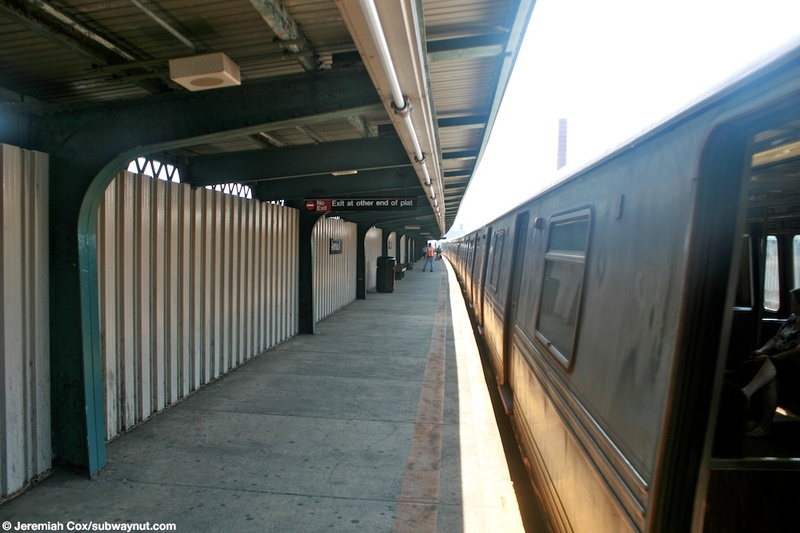 The R160 train currently sopped is the Shuttle train, about to reverse its trip to Coney Island. 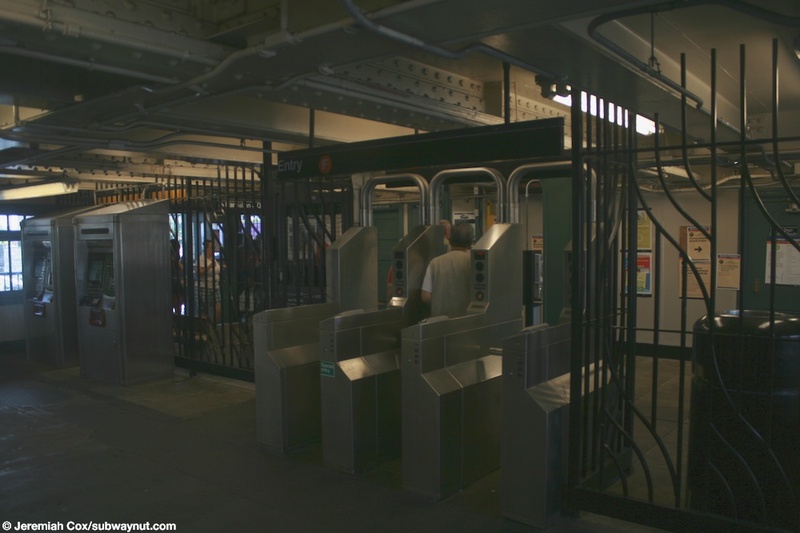 The High Exit Gates to the special exit that was built for transferring F passengers during the reconstruction of the Coney Island Terminal is visible as well. 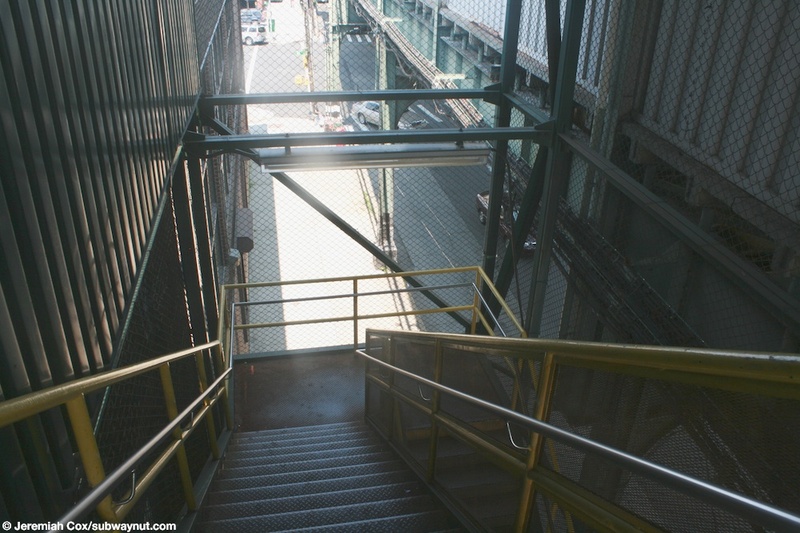 4 August, 2009 (ave_xf2) Looking down the bare bones, temporary looking, exit only staircase structure that leads down from the Coney Island-bound platform to the bus stop below. 4 August, 2009 (ave_xf3) The bottom of the stairwell structure down form the CI-bound platform, with the standard No Entry, Use Entrance at Avenue X sign. 4 August, 2009 (ave_xf4) The Bus stop, and the two story tall temporary structure from the subway station that was built to serve it. (ave_xf5) Looking across Avenue X and approaching the small station house nestled beneath the elevated. 4 August, 2009 (ave_xf6) Looking across McDonald Avenue at passengers descending and ascending from an Entrance to the Avenue X Station. 4 August, 2009 (ave_xf7) An entrance staircase to Avenue X. 4 August, 2009 (ave_xf8) A view of the well worn but painted white station house beneath the tracks for the Avenue X Station. 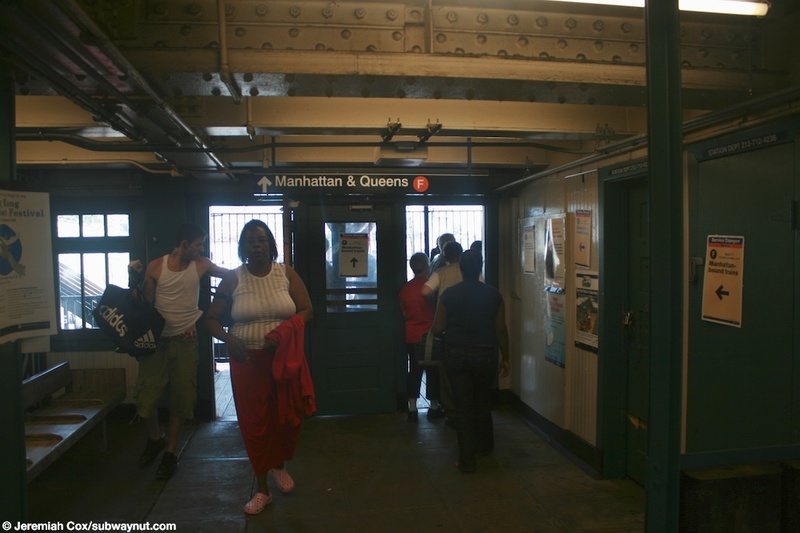 (ave_xf9) Approaching the doors into the station house and the subway system at Avenue X. 4 August, 2009 (ave_xf10) Two MVMs and the turnstiles in the small fare control area at Avenue X. 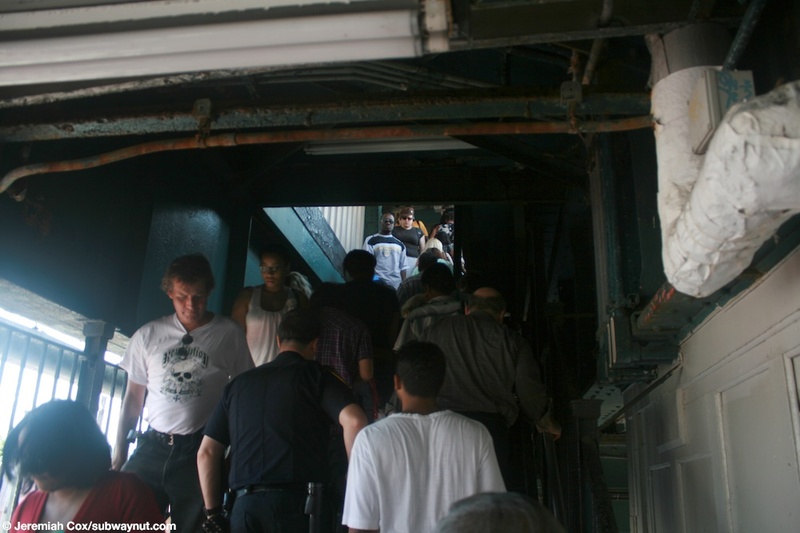 4 August, 2009 (ave_xf12) The crowd of passengers transferring between directions barely can make there way up and down the only staircase on the Manhattan-bound platform. 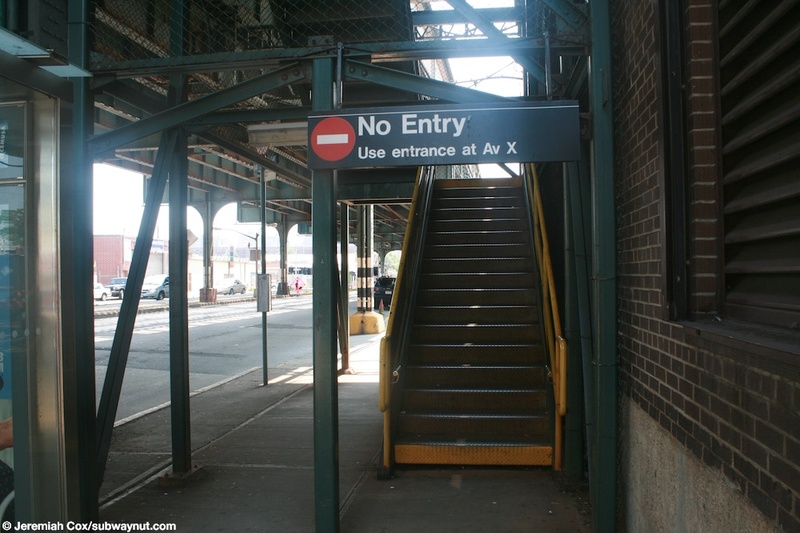 (ave_xf13) Looking out of a Manhattan-bound F train at Avenue X and down towards the end of the platform that leads to nowhere. 4 August, 2009 (ave_xf14) The doors close on a Manhattan-bound F train at Avenue X, the platform is completely empty. 11 August, 2009 (ave_xf15) Approaching the one staircase to the mezzanine are with the station's exit at Avenue X.